Welcome to our weekly round-up of all the best digital marketing stats flung our way by all the best researchers, analysts and statisticians from around the marketing world, who I hope continue to do so after that introduction. Mobile payments will hit $142bn by 2019, but which company will be the dominant force in providing easy payment options? 36% have used mobile payments before, more than double the number from 2012. Nearly three out of five (56%) are interested in using mobile payments for holiday shopping. 24% actually say mobile payments are inconvenient relative to cash, credit and debit cards. Nearly 30% cited privacy concerns as a potential obstacle to them using mobile payments. On the topic of which brand is currently leading the pack, when asked to identify the mobile payment service they would most likely use in-store, 51% mentioned PayPal with Apple Pay in third place with 10%. According to our Conversion Rate Optimisation Report 2014 companies that test more often derive greater rewards from their activities. Companies that saw a significant increase in their sales conducted 6.45 tests per month, compared to just 2.42 tests among organisations that saw their sales decrease. More than half (57%) of companies cited a “lack of resources” as a barrier to improving conversion rates, by far the most common answer. Our research analyst and all-round good guy Bola Awoniyi has more to say on the subject in his four hallmarks of a successful conversion rate optimisation strategy. For the second year running the UK fashion retailer is outstripping (yes a pun) the competition on the visual sharing platform. Content from ASOS generates an average 7,202 pins a week, which is nearly five times more than Amazon (1,620 pins) and almost seven times more than John Lewis (1,096 pins). Decisions, decisions… oh come on! Rakuten Marketing’s reveals that savvy consumers now spend longer than ever researching and comparing products. The average shopper now makes on average 9.5 visits to a retailer’s site before deciding to buy, compared to just 2.5 visits three years ago. Over the last four years, the average number of channels used before conversion has also risen from 1.25 in January 2010 to 3.25 in 2014. And here’s a visualisation on how the UK’s multichannel players fared during Christmas 2013. RadiumOne has discovered that brands are in the dark about three quarters of their online audience, with UK consumers sharing over three times more content via email and IM (which isn’t tracked by web analytics) compared to public social channels. For the following stats, ‘dark social’ refers to any inbound web traffic coming from sources that web analytics are unable to track. It’s got nothing to do with the ‘darknet’, which is where all your favourite experimental electronica musicians share their music. 91% of UK consumers regularly use dark social channels alongside social channels when sharing information online (93% globally). 26% only share in the dark, meaning brands with no dark social strategy in place know nothing about a quarter of UK consumers online – this rises to almost a third globally (32%). The topics discussed most often via dark social channels are typically more one-to-one in nature such as property (89%), careers (87%) and personal finance (83%). Conversely, the topics most discussed via social channels are more one-to-many such as pets (81%), family & parenting (54%) and society (43%). To get their hands on $10m, 25% of people would abandon their friends, family and church. 7% would murder. Based on a survey of enterprise companies, Conductor discovered that 17% of large companies rate their SEO as “very successful” and 28% as “not successful”. However for a majority of enterprises SEO has become more effective in the last year. Christmas is not the biggest season for retail affiliate marketing budgets, reveals R.O.EYE. While 45% agreeing the festive season was a key period, most preferred to direct budgets towards affiliate marketing during the New Year getaway (24%) and UK summer time (19%), with Easter, September’s new school term and Halloween each receiving 4% of the vote respectively. With new web extensions going live on the internet, those that are retail focused are deemed the most valuable by marketers, according to Trademark Clearinghouse. 69% of respondents are interested in registering a .Buy domain. The second most-anticipated domain is .VIP (67%), followed by .Store (65%). 84% of those polled considered registering a new domain name within the next twelve months. Fluent found that more Americans say they’ll spend less on holiday gifts and travel in 2014 than they did in 2013. According to the survey of 994 American adults aged 25-54, 46% of women and 37% of men plan to spend the same or less amount of money on shopping this year. Digital dominates for researching gifts with respondents using online reviews (27%), social media (7%), and daily deals sites (8%). Mobile still lags when it comes to purchasing, with 32% of respondents saying they’ll buy in-store and 19% on desktop, while only 6% will buy through a tablet and 3% via a smartphone. Men are three times more likely to wait till the last minute to shop. Which is exactly why 24 hour service stations exist. Criteo’s holiday shopping data reveals a 70% increase in online sales during a 25 day window leading up to December 18. Mobile devices will play a major role in consumer purchase behaviour this year with a projected 41% of purchases coming from mobile devices and 61% of those coming from tablets. The highest-performing time for purchases via tablets is 8-11pm the highest-performing time for purchases via smartphone is 5–10pm, and purchases via desktop is 11am-11pm. Once the 25 day window closes, sales will fall 49% during December 19-25, compared to the previous week. Like a multi-layered puzzle you might find in the movie Inception or the lyrics to ‘The Onion Song’, may I present you this stat based article within a stat based article… Yes it’s David Moth’s fabulous Black Friday 2014 stats round-up. Comes from Michael Devereaux and it’s presented to you in honour of Friday’s release of the first trailer for Star Wars VII. 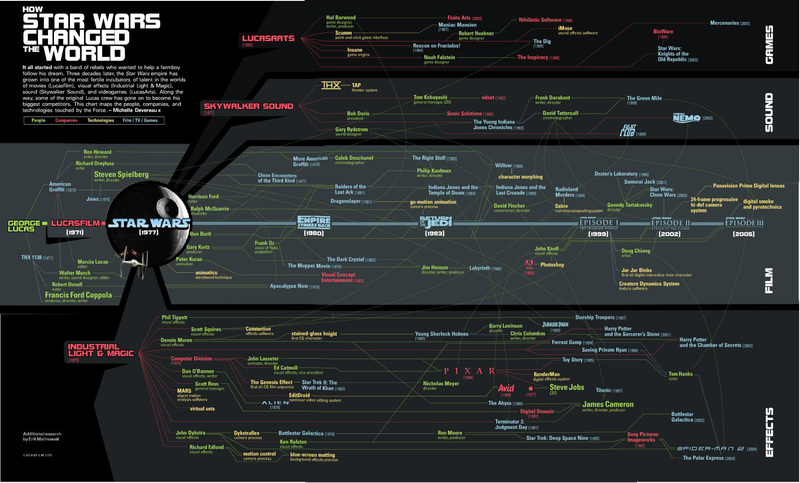 How Star Wars changed the world… (click for larger version). Stats the way I like it. There’s been a shift in command here at stats HQ, which has left this guy (lifts hand from keyboard briefly to point at self) in charge. So from now on you’ll be seeing a few changes around here. Number one: more terrible puns. And that’s about it. Wouldn’t want to rock the boat too much. Now on with the statalaunch! And by golly I’ll be wringing as much entertainment as I possibly can from this latest collection of up-to-date internet stats and data sent to us from researchers, analysts and statisticians across the digital marketing realm.